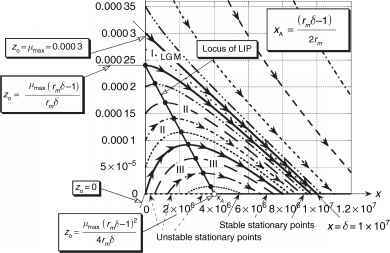 The efficiency of energy transfer within an ecosystem can be estimated as its 'trophic transfer efficiency', the fraction of production passing from one trophic level to the next. 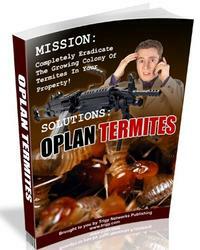 The energy not transferred is lost in respiration or to detritus. Knowing the trophic transfer efficiency of an ecosystem can allow researchers to estimate the primary production required to sustain a particular trophic level. 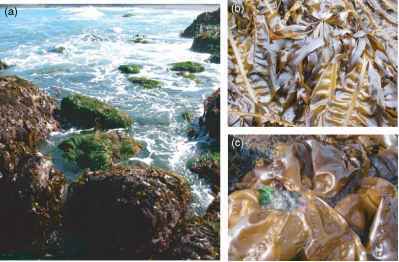 Figure 5 (a) In the low intertidal zone of temperate coastal ecosystems, (b) the ribbon kelp, Alaria marginata, is an annual alga with high growth rates, whereas (c) the sea cabbage kelp, Hedophyllum sessile, is a perennial alga with lower growth rates. During the peak of the growing season, these two species can have a similar stand crop biomass but differ greatly in their production rates because one is an annual and the other is a perennial. Photo by Anne Salomon and Mandy Lindeberg. per m2 of open ocean per year. To support this yield of tuna, bonitos, and billfish, researchers can calculate the production rates of the trophic levels below, assuming a trophic efficiency of 10% and equilibrium conditions. Essentially, to produce of 0.1gCm~2yr_1 of harvested predators (tuna, bonitos, and billfish) requires 1gCm~2yr_1 of pelagic fish to have been consumed by the top predators, 10gCm~ yr~ of zooplankton to be consumed by the pelagic fishes, and 100gCm~2yr_1 of phytoplankton. Note that these values represent the production that is transferred up trophic levels. They do not represent the standing stock of biomass at each trophic level. Knowing the net primary production of the photoplankton allows researchers to estimate the proportion of this production that is taken by the fishery. It has been estimated that 8% of the world's aquatic primary production is required to sustain global fisheries. Considering continental shelf and upwelling areas specifically, these ecosystems provide one-fourth to one-third of the primary production required for fisheries. This high fraction leaves little margin for error in maintaining resilient ecosystems and sustainable fisheries.